Why not opt for a beige knit vest and black skinny jeans? These pieces are super comfortable and look amazing married together. Bump up your look by slipping into black leather mules. Pairing a Maison Margiela Open Knit Sweater Vest Beige from Last Call by Neiman Marcus with teal skinny jeans is a smart choice for a laid-back yet totaly stylish getup. If you're not sure how to finish off, a pair of tan suede lace-up flat boots is a safe option. If you’re a jeans-and-a-tee kind of dresser, you'll like this basic yet seriously stylish combination of a Maison Margiela Open Knit Sweater Vest Beige from Last Call by Neiman Marcus and white ripped skinny jeans. A Maison Margiela Open Knit Sweater Vest Beige and light blue skinny jeans are the kind of a tested casual combination that you so awfully need when you have zero time to spare. Add an instant sultry vibe to your ensemble by rocking a pair of brown suede ankle boots. 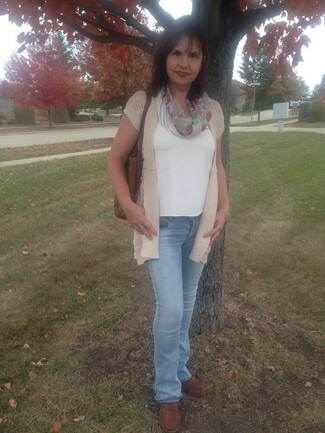 Combining a beige knit vest with white ripped skinny jeans is a wonderful choice for a casual outfit. If you need to effortlesslly ramp up this ensemble with one item, add a pair of tan leather pumps to your ensemble. 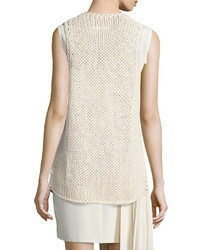 For relaxed dressing with a stylish twist, you can opt for a Maison Margiela beige knit vest and pink skinny jeans. A pair of brown leather lace-up flat boots can integrate effortlessly within a variety of looks.